Winston Churchill called Russia a riddle wrapped in a mystery inside an enigma. We could say Obama’s energy and climate policy is confusion wrapped in muddled thinking inside obfuscation – and driven by autocratic diktats that bring job-killing, economy-strangling, racist and deadly outcomes. President Obama was recently in China, where his vainglorious arrival turned into an inglorious snub, when he had to use Air Force 1’s rear exit. He was there mostly to join Chinese President Xi Jinping and UN Secretary Ban Ki-moon, to formally sign the Paris climate treaty that Mr. Obama insists is not a treaty (and thus does not require Senate “advice and consent” under Article II, Section 2 of the Constitution) because it is not binding – yet. However, once it has been “signed and delivered” by 55 nations representing 55% of global greenhouse gas emissions, it will become binding. China and the US alone represent 38% of total emissions, so adding a few more big nations (Argentina, Brazil, India, Indonesia, Japan and Germany, eg) would reach the emission threshold. Adding a bunch of countries that merely want their “fair share” of the billions of dollars in annual climate “adaptation, mitigation and reparation” cash would hit the country minimum. Few if any developing nations will reduce their oil, natural gas or coal use anytime soon. That would be economic and political suicide. 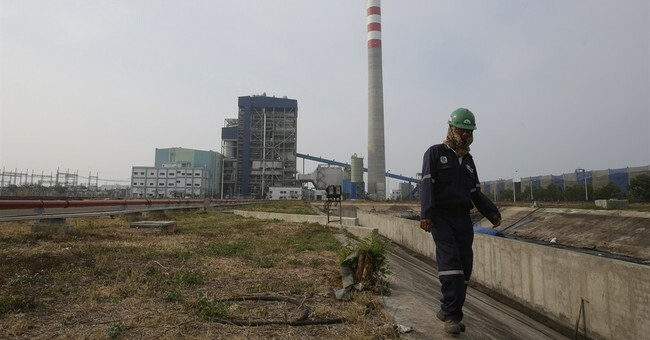 In fact, China and India plan to build some 1,600 new coal-fired power plants by 2030, Japan 43, Turkey 80, Poland a dozen, and the list goes on and on, around the globe. Meanwhile, the United States is shutting down its coal-fueled units. Under Obama’s treaty, the USA will be required to go even further, slashing its carbon dioxide emissions by 28% below 2005 levels by 2025. That will unleash energy, economic and environmental impacts far beyond what the Administration’s endless, baseless climate decrees are already imposing. Federal agencies constantly harp on wildly exaggerated and fabricated “social costs of carbon” – but completely and deliberately ignore the incredible benefits of carbon-based energy. The battle is now shifting to natural gas – methane. Hillary Clinton and Democrats promise to regulate drilling and fracking into oblivion on federal lands. California regulators are targeting cow flatulence! EPA continues to expand ethanol requirements, even though this fuel additive reduces mileage, damages small engines, uses acreage equivalent to Iowa, requires enormous amounts of water, fertilizer, pesticides, gasoline, methane and diesel fuel – and releases more carbon dioxide into the atmosphere than it removes. Wind turbines, photovoltaic solar arrays and their interminable transmission lines already blanket millions of acres of farmland and wildlife habitats. They kill millions of birds and bats (but are exempt from endangered species laws), to provide expensive, subsidized, unreliable electricity. Expanding wind, solar and biofuel programs to reach the 28% CO2 reduction target would increase these impacts exponentially. But all this is necessary, we’re told, to prevent climate cataclysms, like an Arctic meltdown. “Reports from fishermen, seal hunters and explorers all point to a radical change in climate conditions and hitherto unheard-of temperatures in the Arctic zone,” the Washington Post reported. Icebergs are becoming scarcer, in some places seals are finding the water too hot, and within a few years rising seas “will make most coastal cities uninhabitable.” The situation could hardly be more dire. Oh, wait. My mistake. That was in November 1922! Recent warming and cooling episodes are not so unprecedented, after all. However, all this climate confusion, obfuscation, fabrication and prevarication are merely prelude, a sideshow. The real issues here are eco-imperialism, racism and racially disparate impacts. Not the kind of racism the Washington Post alludes to by putting a front-page story about Donald Trump going to a black church in Detroit next to a piece about a black soldier being horrifically lynched at Fort Benning, Georgia in 1941. Nor absurd claims by Detroit Free Press writer Stephen Henderson that Trump is racist for daring to go to that church to “boost his stock among white middle-class voters,” when he has “no interest” in addressing inner city problems. This racism is the sneaky, subtle, green variety: of government policies that inflict their worst impacts on the poorest among us, huge numbers of them minorities – while insisting that the gravest risks those families face are from climate change or barely detectable pollutants in their air and water. In the Real World, soaring energy prices mean poor families cannot afford adequate heating and air conditioning, cannot save or afford proper nutrition, and must rely on schools, hospitals and businesses whose energy costs are also climbing – bringing higher prices, reduced services and lost jobs. Workers who are laid off, dumped on welfare rolls or forced to take multiple lower-paying part-time jobs face greater stress and depression, reduced nutrition, sleep deprivation, greater alcohol, drug, spousal and child abuse, and higher suicide, stroke, heart attack and cancer rates. That means every life supposedly saved by anti-fossil fuel policies is offset by real lives lost due to government actions. Unemployment among minorities, especially black teens, is already far higher than for the population at large. Crime and other inner city problems are far worse than elsewhere. Policies that further cripple economic growth, job creation and revenue generation will make their situation infinitely worse. To them, a planet free from inflated, hypothetical dangers from modern technologies is more important than lives improved or saved by those technologies. In Earth’s poorest countries, the outcomes are lethal on a daily basis. There, billions live on a few dollars a day, rarely or never have electricity, and are wracked by joblessness, malnutrition, disease and despair. Millions die every year from malaria, lung infections, malnutrition, severe diarrhea, and countless other diseases of poverty and eco-imperialism. “If everybody has got a car and air conditioning and a big house,” Mr. Obama told South Africans, “the planet will boil over.” He can jet, live and golf all over the planet, but they must limit their aspirations. Thus his Overseas Private Investment Corporation refused to support a gas-fired power plant in Ghana, and the United States “abstained” from supporting a World Bank loan for South Africa’s state-of-the-art Medupi coal-fired power plant. Meanwhile, radical environmentalist campaigns limit the ability of African and other nations to use DDT and insecticides to control malaria, dengue fever and Zika – or GMO seeds and even hybrid seeds and modern fertilizers to improve crop yields and nutrition. No wonder Philippines President Rodrigo Duterte said his country will not ratify the Paris climate treaty. “Now that we’re developing, you will impose a limit? That’s absurd,” he snorted. He’s absolutely right. These anti-technology campaigns are akin to denying chemotherapy to cancer patients. They result in racist eco-manslaughter and must no longer be tolerated – no matter how “caring” and “well-intended” supposed “climate cataclysm prevention” policies might be. If we’re going to discuss race, racism, disparate impacts, black lives mattering, and protecting people and planet from manmade risks, let’s make sure all these topics become part of that discussion.